Super Search Thingy Is Alive!!! With a bit of free time I’ve had lately being unemployed, I was able to work on this project and finish it. I’m very happy to have it done and working so well. It’s a keyboard activated search tool for a specific website built to act like the application launcher Alfred App and QuickSilver. I went through each page in the Kynetx documentation site and indexed each page by hand. 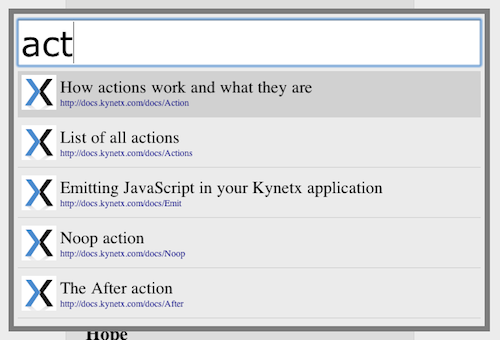 I didn’t include all pages which I believe makes this a much more powerful search for Kynetx developers. I also assigned key words to each page based on what I thought it should be searchable by. If you have suggestions, let me know because I would love to hear them. If you like it, you are free to use the code in any way that you like. Cheers!